A heritage railway has reopened after closing for three months following a critical inspection by the rail watchdog. West Somerset Railway (WSR) decided to close after the Office of Rail and Road (ORR) recommended improvements to governance and infrastructure. WSR said the ORR had now given it "a clean bill of health to reopen". 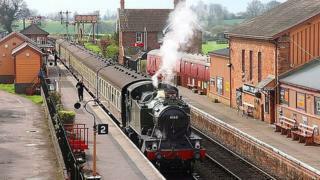 The railway is a branch line of the old Great Western Railway and runs from Minehead to Bishops Lydeard. WSR chairman Jon Jones Pratt said: "It's been a race against time to try and get all of the work completed and a great testament to the hard work and dedication of our staff, volunteers, contractors and supporters." He said the changes included infrastructure works costing about £170,000, staff training and the introduction of "competence and compliance systems".